Your innocent-looking cat is not the only one snitching objects, your friendly canine also loves stealing weird stuff. All you have to do is give his favorite bone-shaped biscuit, pet him and he is all set to travel to distant places to bring back strange items for his master. 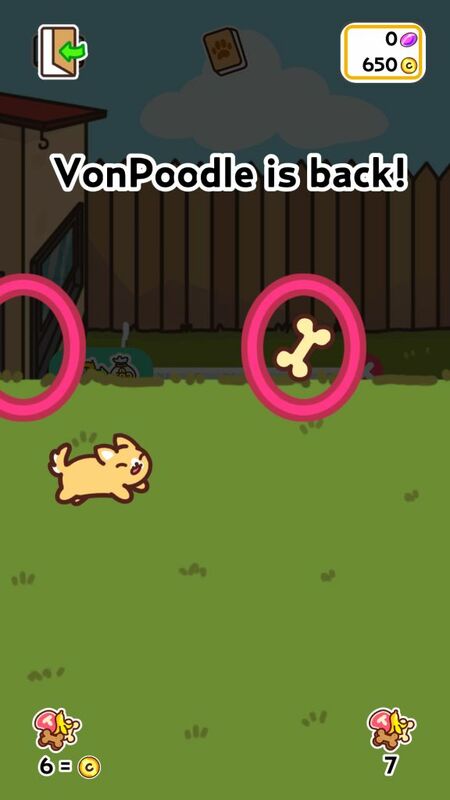 Hyperbeard’s new game lets you pamper your “Klepto Dogs” and not kitties. It’s pretty similar to other games, but instead of cute kitties, you will be collecting dogs and items brought by them. After all why should cats have all the fun! Besides collecting items and cute pups, you will also play mini games, take a selfie with your doggo, dress up your favorite dog with cool accessories and unlock new locations to get more items. 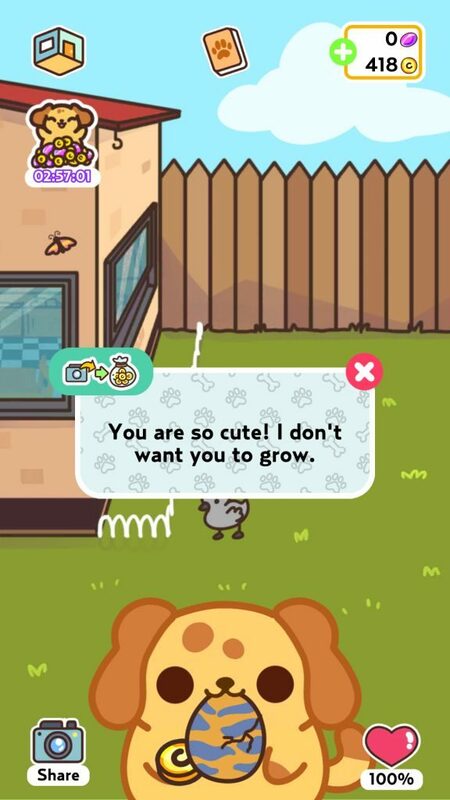 There are so many things to do in KleptoDogs! These tips and hints will help you earn coins and gems. Just like your kitty, your virtual pupper can be irritated, depressed or plain unhappy. You can raise his mood. In return, he will bring more coins and new items for you. Your dog’s mood meter is a tiny little heart shown on the lower-right corner of the screen. You will have to fill the meter to 100 percent by feeding, petting or giving him a nice little scrub. 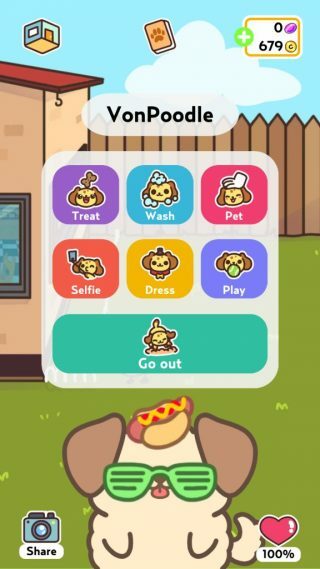 Just tap your pet to bring up his grooming menu and then complete all actions to raise the heart level to 100. You can then send him to fetch things (other than his favorite bone). He will also bring coins, and if you are lucky, he may get back to you with some gems. Just make sure his mood is at 100 percent if you want more coins. When a dog brings an interesting object, he proudly shows it you. You can show his newly discovered item to your friends. All you have to do is tap the green button on the upper left corner of the text box that appears above him to share the pic via social media sites, email or messengers. You will be rewarded with bonus coins. You will still receive coins if you don’t share. When the sharing box appears on the screen, just tap the cancel button and collect your rewards. You will receive 19 coins for sharing. At first, your pup will bring back items quickly, but as times passes by, he will take several minutes to come back home. Maybe he wants to make you happy, which is why he will travel far and wide to bring the most precious item. You can close the app and be notified when he comes back or play some mini-games to pass your time. These games are very easy to play. You will also earn some coins while playing. The play icon appears when the dog is out in search for objects of interest. Tap the “Play” button on the lower right corner of the screen to access mini games. In the first game, a kitty makes an appearance. Tap the screen to make him jump over hoops to collect treats. You will receive a coin when you collect 6 treats. You may also spot a coin in a hoop, so don’t forget to jump at the right moment to catch it. The second game is a lot easier – You will have to tap on sparklers on the ground to dig a burrow and unearth treats. The more treats you dig up, the more coins you will earn. In the third game, you will have to move a cute dog to catch treats tossed down by the mystical doggo resting on a cloud. Catching 6 treats will earn you a coin. If he is pleased, he might throw a coin or two. 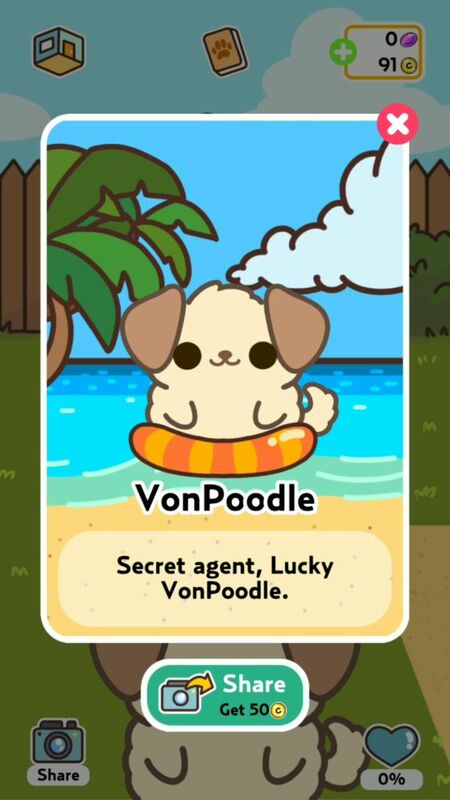 You will get a new canine early in KleptoDogs and you can get more if you spend 8 gems to acquire one. Once you begin collecting dogs, you can switch to a different one if your current pup is bringing the same item over and over again. Your favorite dog must be tired, so why don’t you give him a rest and send another dog to fetch new items? Do note that when your dog brings the same item, you would still get coins. But if you want a brand new object, then there’s no harm in experimenting a bit and changing your dog as you will have to collect 101 objects to unlock the kitchen area. Tap the album to bring up the menu. At the bottom of the menu are two social media icons. You will have to like their page on Facebook and follow them to get free gems. Gems are required to get new dogs, and they were never easy to earn in Klepto-verse. Thankfully, there’s a simple way to earn them in Klepto Dogs. Tap the album with paw mark on it. Now tap on “Shop”. Under “Free Gems” you will be able to collect those purple jewels if you complete simple offers. They range from installing an Android app to completing certain quests and levels in popular games like Lords Mobile, Castle Clash and Angry Birds Evolution. After completing an offer, you may have to wait for 24 hours to get gems. Since these are in-game offers, they are pretty safe. Make sure you select those that offer maximum credits. By now you may have earned loads of coins, so why don’t you put them to good use. You can exchange them for a gem. You will have to shell out 250 coins to get a gem. Use them when you are just few gems away from getting a new pupper. To trade, go to album and tap the shop icon. The mystical burning dog, much like the spiritual cat in the previous games, appears every day. You just have to tap him to get coins. Keep tapping him until he vanishes to get lots of coins. You can also watch a video to get 50 coins. The video icon appears frequently, especially when your cat goes out to bring cool items for you. You can also access this offer via shop in your album. You can save coins and then spend some to buy gems. But if you are impatient like me, you can spend 100 coins to use the bell and your pet doggo will be right before you, with an item in his mouth. Use the bell when your dog is taking too much time to return. The time taken to head back home is shown in seconds, so you can clearly guess how much time it will take to return if you convert seconds into minutes. Now that you have acquired a new pup, it’s time to show his pic to your friends. You will see a share button under the picture of your new dog. Tap it and share the pic with your friends to get 50 coins. You will still receive coins if you tap the button, but don’t share the pic.